This is the sixth volume of the series being published by OUP in collaboration with the Hospice and Palliative Nurses Association, aimed at providing palliative care nurses with quick reference guides. As with the other volumes, the material is drawn from the Oxford Textbook of Palliative Nursing, which by its sheer size provides considerably more depth. The book includes a chapter on Bereavement, and I was pleased that they suggested it might simply be a normal part of life (c.f. The DSM-5’s categorization of bereavement reactions as MDS – major depressive syndrome – even if you lost your loved one in the last two months). 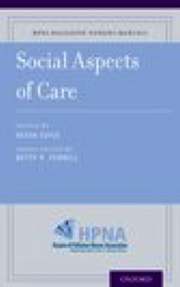 I was taken by the quotation at the end of the chapter: ‘A Turkish expression in the presence of death is, “May you live.” That indeed is the challenge of bereavement.’ There are chapters on Supporting Families in Palliative Care, Planning for the Actual Death, and Cultural Considerations. These chapters are enhanced by lots of lists and tables and provide a quick reference resource and what is discussed is applicable to all palliative care patients. The initial chapter on Sexuality surprised me. I accept that it may be important for the younger patients, but it is not relevant to the majority of palliative care patients that I see. Discussing sexual activity with older patients being prescribed thalidomide or lenalidomide, which is a legal requirement, often leads to very amusing statements by the patient or spouse. Yes, sexuality is important, but only for some of the palliative care population, and I would have put it at the end of the book. This book is about illness narratives – the importance for those who suffer to tell their stories, and the importance for us who care for them to listen and understand them. It is written by a medical sociologist who is professor of sociology at the University of Calgary, who also brings his own recollections of having a heart attack at a relatively young age, followed by surgery and chemotherapy for testicular cancer. Whilst not claiming his list to be exhaustive, Frank groups illness narratives as restitutive, chaos or quest in nature. Restitutive stories are the most frequent and are about the triumph of medicine and attempt to outdistance mortality by rendering illness transitory. Chaos narratives are about life never getting any better, and the voice of the teller is often lost in the chaos. Quest narratives speak from the ill person’s perspective and meet suffering head on. The main text is unchanged from the 1995 edition. 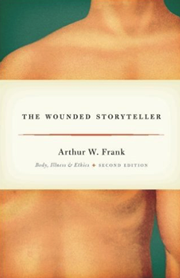 In the 2013 preface, Frank says that he wrote the book because ‘people need a guidebook for when they become wounded storytellers.’ That may be true, but very few individuals with a serious illness, never mind those whose lives have descended into chaos because of illness, would get through the detail in this book. People with serious illness are not going to sit back and ponder whether they should write a restitutive, chaos or quest narrative; and the question is irrelevant anyway as Frank admits any individual’s story may go from one to the other and back again as the tale unfolds. But for healthcare professionals working in palliative care, who believe that listening to the patient’s story, be it written or oral, is an important part of holistic care, this book provides a lot of useful information about the origins, types and meanings of those narratives. There is no doubt that illness narratives are important for both the patients and for the healthcare professionals. I did not find this book particularly easy to read, but on reflection there is a lot of material worthy of contemplation as we strive to be better, patient-centered carers. 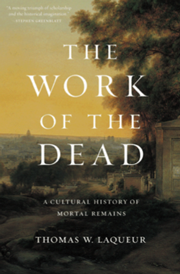 This book is about how and why the living have cared for the dead, from antiquity to the present, and what death leaves behind for the living through the dead body or mortal remains. The book begins with Diogenes the Cynic (c. 412-323 BC), who directed that when he died his body was to be ‘flung out unburied’ over the walls of Corinth and left to be devoured by beasts. He was right in one way – it made no difference to him; but in another way, he was wrong – the dead body and how we treat it has mattered, everywhere and across time. Focused primarily on Western Europe and European North America, this cultural history of mortal remains abounds with absorbing anecdotes and vivid information as Laqueur traces the drift from shrines on behalf of holiness, towards building shrines to memory itself, the transition from the ‘mouldering heaps’ of the village churchyard to the utopian modern cemetery, and finally, the introduction of cremation. Information wise, this is a monumental work, and I did not find it light reading. But I found it interesting. 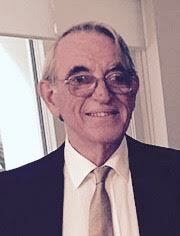 Thomas W. Laqueur is the Helen Fawcett Professor of History at the University of California, Berkeley. 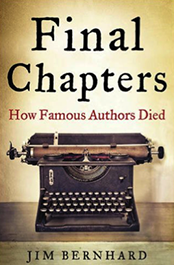 This book provides a short history of the life and achievements of 103 famous authors and the circumstances of their demise, as well as what they had to say about death and dying beforehand. Authors are a good choice, because few were short of a word and most had a way with the pen. The authors chosen range from Aeschylus and Socrates to Ephron and Ebert, and are grouped into The Classical Age, The Middle Ages, The Renaissance, The Enlightenment, and the Romantic, Victorian and Modern Eras. Jim Bernhard is an author and playwright, actor and theatrical manager from Houston, Texas. I found this book both interesting and enjoyable. One cannot help noticing the awful morbidity and mortality that afflicted families in the past, but there are some jewels here. So, by way of a taste (not a test), to whom are the following attributed? Answers in next month’s Book Reviews. Diagnosed with metastatic hepatocellular carcinoma shortly before his fortieth birthday, this is Lucio’s story of the last 100 days of his life. He vows to make them the happiest, to create the best possible memories for his children, and to win back his wife. 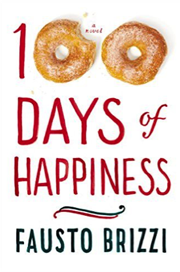 It is full of colorful Italian characters and scenery, lots of humor, and that’s to say nothing of all the food. Lucio is both likeable and entertaining, although I found his character unfortunately inconsistent – from being what sounds like a bit of a knucklehead at school, growing up to be a professional water polo player and later a personal trainer, he is remarkably knowledgeable about history, the interpretation of life, and the nuance of sentiment. I enjoyed the first 99 parts of this book. It led me to reflect on how one can or should respond to a terrible situation like this. Do you withdraw quietly, except from your loved ones, or do you rage on, as Lucio chooses to do? However, I was dismayed by the last chapter, when Lucio boards a bus to go to Switzerland for physician-assisted death, which I felt was a complete contradiction of what he had been working to achieve. Fausto Brizzi is an Italian screenwriter and film producer.